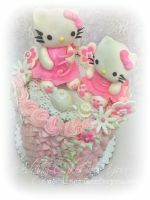 This Princess Garden Cake was for a little girl whose family had never been financially able to throw her a birthday party. 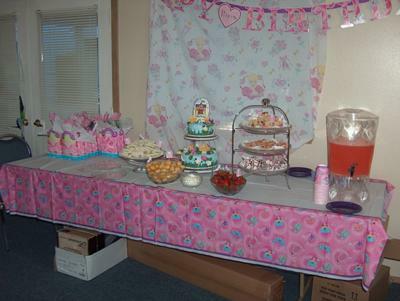 She was turning 8 and was madly in love with "Fancy Nancy", so my daughters and I threw her a tea party birthday for 12. 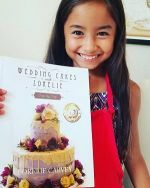 The look on her face when she saw the cake was worth every second. 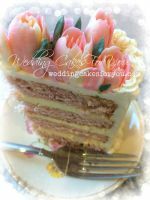 The cake flavor was strawberry lemonade (I made a lemon pudding cake and added some strawberry crystal light mix), each tier was three layers, covered in sky blue whipped buttercream. 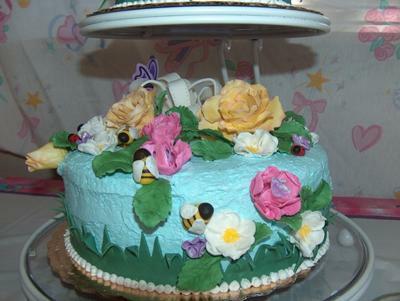 The grass, bow and butterflies are a 50/50 mix of gumpaste and fondant, the flowers and leaves are all gumpaste, and the ladybugs and bees are all fondant. 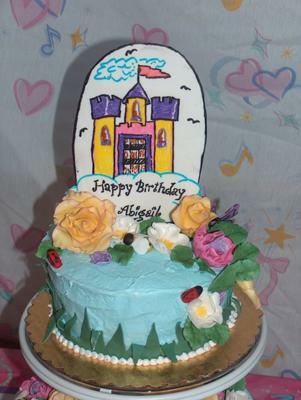 The castle sign on top is gumpaste rolled thin, traced with a veining tool over a drawing and colored with edible food coloring markers. We used the markers for the stripes on the bees and the detail on the ladybugs and butterflies too. 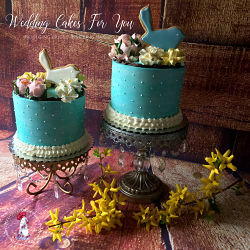 The next time I do a cake like this, I'll make the grass taller and have it poking through a picket fence on the bottom tier, and the top tier will have clouds and birds and butterflies on it instead of more garden. I won't bother wiring up all the roses and leaves for something like this again, most of them weren't needed because they were basically "glued" to the frosting. I'd make the butterflies out of pure gumpaste, and roll them thin like flowers, basically just take more time with them. In general, not bad for a three-day job! Hi Nickie, Very nice! 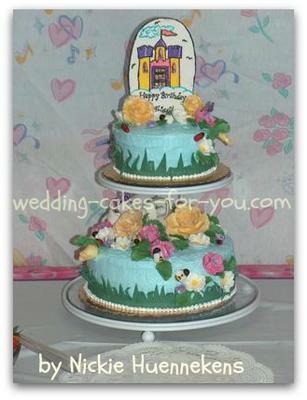 Thank you for adding your Princess Garden Cake to the Cake Decorating Pictures page. 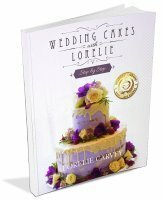 You gave us some helpful cake decorating tips and it's a very sweet story and cake. I love the lemon and strawberry combo. What a great idea to add the Crystal Light to the mix too. 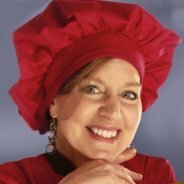 Thanks and Happy Baking and Cake Decorating to you!